We took a not-so-quick drive up to Baguio last weekend to enjoy the weather and so that I could attend the one day seminar “Families’ Guide to Estate and Tax Planning” at the Baguio Country Club organized by the Center for Global Best Practices (CGBP). I’ve had my eye on this seminar for quite a while now, but was always put off by the steep price of Php8,900++ just for a one day seminar. So when I saw that the CGBP would hold the same seminar in Baguio for a third of the price, and after I confirmed that I could use the Court of Appeals Baguio cottage assigned to our division, I immediately paid my seminar fee and locked in my slot. I enjoyed the seminar and the speaker, Atty. Nicasio Cabaneiro, was a hoot but I’m really glad I waited for the reduced price because when it comes to takeaways and new knowledge on estate and tax planning, there were honestly not a lot. I took a full semester of wills and succession in law school, so the whole seminar ended up being a quick review. Nothing new to be perfectly honest. Also, between the estate planning session in my RFP course and Atty. Angelo Cabrera’s book “Thy Will Be Done”, the most entertaining law book I’ve ever read bar none, it seems I had pretty much covered the foundations of estate planning. On the other hand, I can imagine that if you’re not a lawyer, you would have been overwhelmed with the influx of data but would have hopefully been spurred to action to get your estate in order ASAP. Or at the very least to come up with a will, making it well worth the registration price IMO. While I may not have had any new takeaways when it comes to estate planning, the anecdotes shared by Atty. Cabaneiro from his practice and experiences with the BIR were well worth the (reduced) admission. It’s really these “war stories” that inspire me to attend seminars, to know what it’s like from someone who’s been there and done that. I won’t recommend this seminar to a fellow lawyer, but if you avail of the reduced price (CGBP calls it their missionary seminars) and bundle it with a weekend in Baguio with your family, then it becomes a very sweet deal indeed, even if you already have a background in estate and tax planning. As for Baguio, I know a lot of people have complained about the deteriorating air quality and loss of pine trees because of the erected SM, but the 10°C mornings still felt very invigorating to this city girl who has long resigned herself to muggy weather. Although we did make it a point to avoid Session Road altogether (too polluted and way too much jeepneys!) and basically just limited our stay to the Camp John Hay area and the Court of Appeals compound. 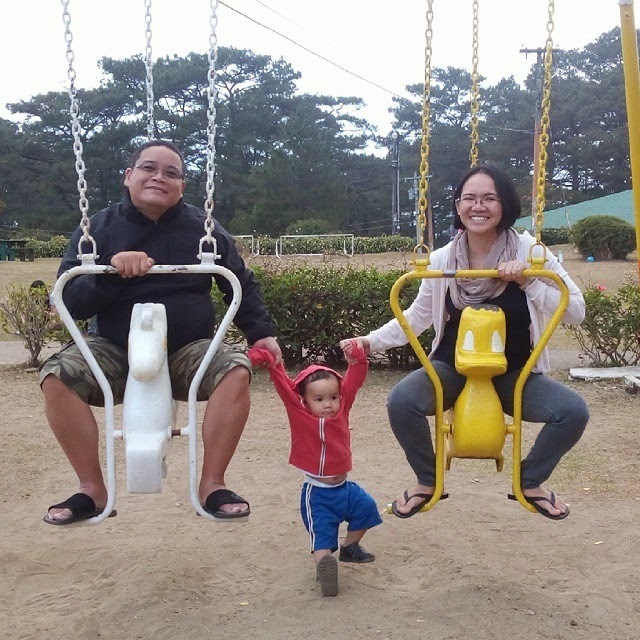 My husband shares my love of Baguio and Sagada, and we hope to one day bring our son there too, to show him just how beautiful the Philippines really is and how blessed he is to be living in a country so diverse and teeming with nature’s bounty. Cute mam jill, ang gandang tingnan ng family nyo !! !